I am Joaquin the Cow. This is a music blog. This is a music blog. This is a music blog. This is a music blog. This is a music blog. This is a music blog. This is a music blog. This is a music blog. This is a music blog. This is a music blog. This is a music blog. This is a music blog. This is a music blog. In the age of Robedoor, P-Haunt and Gowns (oh my), little is said about the New York drone scene. While the "blissed-out" and "easy-going" vibes of Los Angeles' drone bands are groundbreaking, incredibly relevant and ultimately amazing to listen to, they seem to overshadow the rest of the country's noise and drone bands. I don't know, it could be the fact that I live in LA and I only hear about our drone bands and how great they are (and they most definitely are). New York is obviously no newcomer when it comes to drone and noise. In fact, most developments within the genre (no wave etc.) have come from New York and it's endless supply of talented bands. It seems that lately, after what could be observed as some what of a stagnant period, New York is having something of a noise renaissance. With bands like Animal Collective, Gang Gang Dance and Excepter breaking through to larger audiences, it's no surprise that more people are coming around to the noise-party. 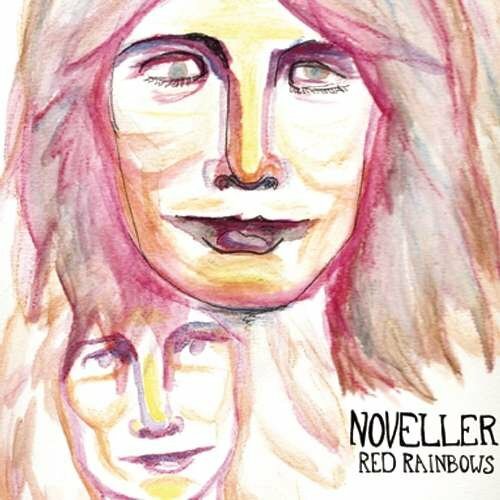 Noveller, however, is no newcomer to the scene. Sound artist / filmmaker Sarah Lipstate got her start playing in famously avant-garde troupes with revered composers: she's played in Glenn Branca's guitar ensemble and was a part of the infamous Rhys Chatham Guitar Army. She lives every noise musician's dream! She has also played in bands both legendary and obscure such as: Cold Cave, Parts & Labor, One Umbrella and Sands. Lipstate's newest record reminds us of what all good drone music should be: masterful, meditative and awe-inspiring. Red Rainbows is so cleverly constructed that it pulsates with impressive and what is ultimately going to be deemed classic, vibes. The track lengths on Red Rainbows get longer as you go along, but you'd never know that. Lipstate ensures that the listener never has second thoughts about where she is taking them and creates an entire aural plane based on those good feelings.